JP Morgan working on a $1.4 Billion tax refund…….and there are others….. The same guys that made a boat load of money just before the bottom fell out? Didn’t they make a lot of money recently? That law let companies apply losses from 2008 or ’09 against taxes paid in the previous five years, instead of the previous two years. Failed Seattle thrift Washington Mutual is eligible for about $2.6 billion in tax refunds, thanks to big losses in 2008. Now J.P. Morgan, which took over WaMu’s banking operations in September 2008, is in discussions with the Federal Deposit Insurance Corp. and bondholders about the refund. 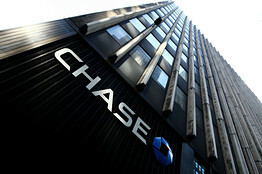 According to people familiar with the talks, an agreement under discussion would let J.P. Morgan claim more than half of the total, to be held in an FDIC receivership as part of a larger settlement with bondholders. J.P. Morgan could dip into that pot to satisfy certain claims related to WaMu’s collapse. Some critics have found the corporate-tax-refund technique wanting as a stimulus or job-creation move. Prior to Congress’s passage of the $787 billion stimulus law in early 2009, the Congressional Budget Office looked at six possible stimulus approaches and ranked this one least effective, saying each corporate tax dollar refunded would generate at most 40 cents of boost to gross domestic product. The corporate-tax-refund approach wasn’t included in the big stimulus bill early in the year, but was part of legislation in November that extended jobless benefits. He, he, he….so they forgot to add it…but got it back in anyways? Ah, the gift that keeps giving…..To Big guys anyways……..The U.S. Treasury….the same people we gotta pay…. Dispelling stimulus myths … what took so long? Writing on his “Chairman’s Corner” blog, Devaney refuted oft-repeated complaints about “phantom” Congressional districts (“These were simple clerical errors”), claims that he reports to President Obama (“We do not take orders from either the administration or Congress”) and that the money is funding “stupid projects” (“We have nothing whatsoever to do with distributing funds or deciding what projects get funded”). A fair point, Earl, but where were you last year when the program launched? Why didn’t you speak out then? Where were you four months ago when news reports and critics highlighted those incorrect Congressional districts? Still seems like too little, too late.